How many moments can you remember from a lifetime… frame by frame… as if they happened yesterday? For me, it’s a short list – and this was one of them. It’s a July afternoon in 1976, and I’m slumped in an adolescent, introspective heap on the sofa. In the background, the TV rolls live footage from the Montreal Olympics. It’s mostly the ‘B sports’, and early heats of weight-lifting and discuss scroll past me as quietly as faded wallpaper. But suddenly, I’m back in the room – and along with millions of people around the planet – I’m watching the elfin figure of Nadia Comaneci focus her gaze on the Uneven Bars as she tees up for the Olympic final. The next minute is engraved on my memory. Comaneci takes a step towards the bars… springs up… and becomes the closest thing I’ve ever seen to a human being in flight. She seems immune to gravity. While Comaneci’s in the air, she makes us all weightless. But suddenly she’s back on the deck, and reality kicks back in. The crowd in Montreal goes bonkers, and the camera pans back to the scoreboard. The crowd gasps, Comaneci pales, the commentator swallows audibly. And then the audience screams with one voice as they, the commentator and Comaneci realise she’s the first gymnast in Olympic history to score a perfect Ten. Back to teenage me. I’m in turmoil. Yes, yes, yes – this other-worldly creature (two years younger than me) has just done something truly extraordinary, and charmed the entire planet. But PERFECT? As she came back to Earth, didn’t I see her wobble for a millisecond? Surely 9.99 would have left a door open. Breath-taking? Yes. Genius? Yes. Best in history? Yes. But PERFECT? No. I’m with the Omega tech team – there’s no such thing as four digits on the human scoreboard. People don’t do perfect. 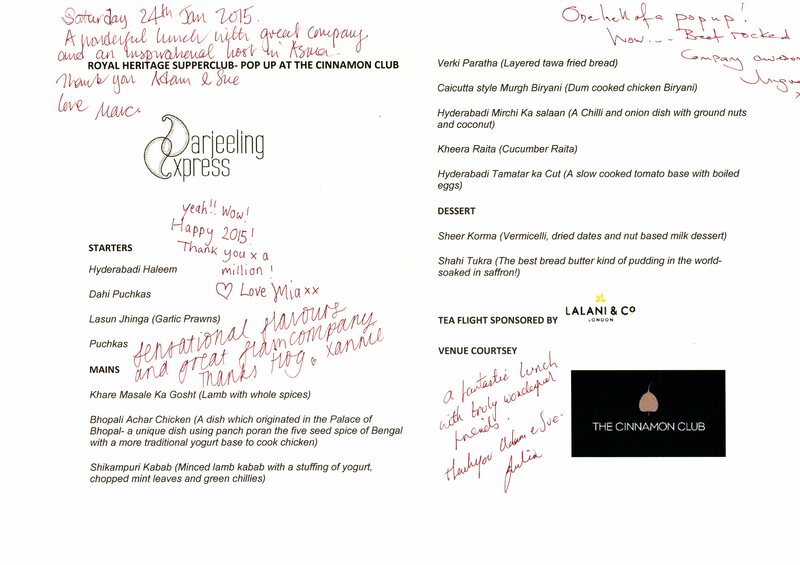 Fast-forward 39 years, and I’m sitting in the Cinnamon Club, bubbling with anticipation at Asma Khan’s ‘Darjeeling Express’ pop-up lunch in the high temple of Indian cuisine. It’s January 2015, and this is only the second time that that Asma has cooked here (we hadn’t met when she chef’d her first Cinnamon Club pop-up – and I felt wounded by what I’d missed. Vivek Singh had famously led the room in a standing ovation of Asma’s biryani, and I’d begged her to invite me to any follow up). So here we are, just minutes away from my first ‘Mughal Feast’. Is it just me, or is there part of everyone who loves curry that wants to know what is was like to eat as a Mughal emperor? Can you read about the era when Indian princes competed to create the greatest ever feasts – and when top chefs were feted like the most famous poets and artists – without wanting to live it? Just once? While I know it doesn’t help to ramp up expectations – I’ve dialed everything in my head up to 11. I am in the greatest restaurant in the world, being looked after by the best pop-up hostess I’ve ever met, and about to taste the last word in imperial Indian luxury. I am hyped. Just to add to the excitement, I’ve invited as many of the people I love as we can fit on the table. My wife Sue, my daughter Mia and her friend Xannie, my Curry Club buddies Michael and Marc, and Michael’s new wife Julie. I want them to love every mouthful. And while I know it’s crazy for me to feel ‘butterflies’ before a meal (Asma’s doing the cooking – all I’m doing is eating) I still somehow feel like an athlete… waiting for the starting gun to fire. The first course is at the table: Lasun Jinga (garlic prawns). The spices are married to the seafood as seamlessly as the sweetness in honey. I have never tasted anything like it. Then there’s Hyderbadi Haleem. As the dish is being served in simple earthenware bowls at our table, the lovely Asma appears to explain its history: that in the closing moments of a bitter sectarian siege, the community trapped inside the city had come to share their last night alive together. Pooling the few edible morsels they had left – bones of dead livestock, oats, lentils – they simmered the unlikely mix of ingredients until dawn. And created Haleem. The story of the last meal is exquisitely poignant. And Asama’s dish is exquisite. In a way I can’t explain, it tastes more intensely of marrow bone than marrow bone itself. Next comes the Shikampuri Kabab – meat minced again and again until it’s the texture of silk – then stuffed with yoghurt, fresh mint and green chilies. The person Asma’s invited to sit next to me does ‘taste’ for a living – and it’s his palate that selects the gourmet teas (at £2,000 a kilo) which grace some of London’s top restaurants. As he eats the Kabab, he pauses, then turns to look at me: “That’s the single most delicious thing I have ever eaten”. And I would agree. Four starters (each of which is served two or three times). Eight main courses. We make friends with Khare Masale Ka Gosht, Bhopali Achar Chicken, Hyderbadi Mirchi ka Salaan. I can still picture and taste these dishes now – and the latter (green chilies with onion, ground nuts and coconut) would justify the chili’s historic journey from South America to India. It’s sensational. And that’s all before Asma serves us her Calcutta style Murgh Biryani. I have biryani recipes in a number of books, and have never dared to cook it. It’s too big, too emblematic – and too technical. Whole websites are dedicated to the search for the perfect biryani. If this dish were a high-board dive, it would have a complexity rating of 6.0. Asma’s Calcutta style Murgh Biryani disappears without a ripple. The word ‘fragrant’ starts to get you there (and maybe there were words in the Mughal courts to describe a taste this subtle) but the English foodie vocabulary falls short. The entire table goes silent in appreciation. Finally, two desserts: Sheer Korma and the saffron-infused Shahi Tukra. I still miss the Sheer Korma – and cook my own imitation at home to help manage the separation anxiety. In among it all, my table buddy – the gourmet tea sommelier – takes the room through a tasting of some of India’s rarest, most costly and most delicious infusions. We sip the tea from tall, tulip-shaped wine-glasses. It is a taste revelation. At close to 5pm, and countless courses and flavours, the lunch winds to a close. I’m surprised to find I feel as light as if I’d just eaten a salad. Family and friends are getting from our table, and there are hugs and smiles all round. It doesn’t happen often, but it’s real. And in a Mughal feast where Asma needed to conduct an orchestra of dishes and people – nothing, nothing was less than perfect. In July 1976, Comaneci went on to score six more perfect Tens. In June of this year, Asma cooked another perfect pop-up at the Cinnamon Club. Turning the lens right back to the Mughals themselves – whose reign spanned the mid-16th to 18th centuries – maybe each of us would be surprised to glimpse the depth of their legacy: an empire that embraced more a quarter of humanity; the architectural masterpiece of the Taj Mahal; the invention of the rocket; a shipping industry so sophisticated it built-to-order for the European fleets. And then the food… cooked by Asma as she keeps alive their centuries’ old tradition. This entry was posted in Darjeeling Express: Asma Khan. Bookmark the permalink. Beautiful. One of the best pieces of food writing I’ve read in ages. Looove that tieback to that teenage memory!! !